As a child or teenager, how many times did you cringe when you heard those dreaded phrases repeated to you over and over again? Those phrases that made you sit there with your best eye roll face imaginable. You'd respond with things like blah, blah, blah or 'I would never say that to my child'. Well guess what, I bet you've said some of the following to your child. 3) If someone asked you to jump off a cliff, would you do it? 11) Do you think I was born yesterday? 17) What part of no don't you understand? 24) What did your last slave die of? 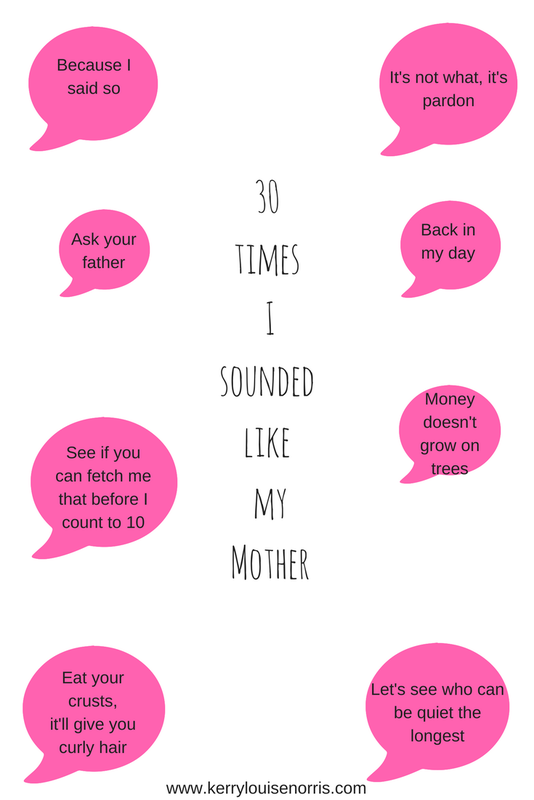 What phrases do you find yourself saying that you heard through your childhood? That is my latest one! I think we all turn into our Mums at some point. HAHAH yes to all of these! I find myself turning into my mother more and more by the day! Hahaha!!! I love this post!! I find myself saying the most “mumsy” things now too. I haven't, yet, as I have no children-but I'm sure I will. I ALWAYS hear my Mum when I admonish the kids. I pretty much say everything on that list.